This is a particularly special project. 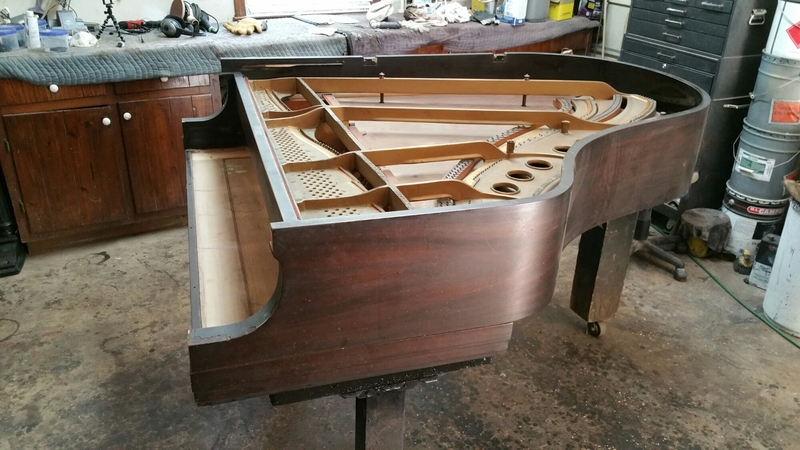 I am collaborating on this restoration with Mr. Robert Parker a Registered Piano Technician (RPT) in Charlotte, North Carolina. We have worked on several projects together but we are both particularly excited to see the outcome of this one. This I think is the second Steinway….. the first being a Model A several years ago. Before I picked this piano up from the customer Mr. Parker removed the strings and action after taking all the necessary measurements to install an entirely new action. I will go into detail about this later. So now I have the piano and will begin the teardown. Robert took my grandmother’s 1920’s piano that everyone said would look good on a bon- fire and made it look like new. Inside and out. No one believed it was the same piano, except for the stains on the ivory keys. Which I asked Robert to leave on there. Beavers Piano did such a wonderful job that I had him re-do my 1900 Secretariat and couch. I wouldn’t trust anyone else with my wonderful antiques to anyone other than Robert and his son. They pay such wonderful attention to the details you ask of them, you know they will do it exactly the way you ask them too.